Why can't I never learn to like the track Pimpf (Music For The Masses)? It was a great concert opener back in '88. Thanks for the news. Anything official yet? 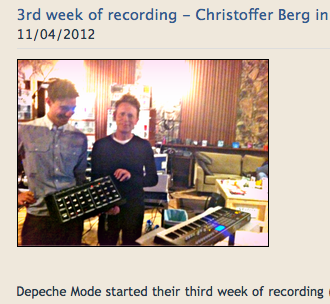 Full details, including track listings and cover art, are on depechemode.com. Not the best of their tours. Although one of them...tours that is. Picked the blu-ray and digi-pack versions up of the 'TOTU'. Blu-ray is outstanding quality, both in terms of picture and audio. Shame the bookelt is so badly produce with low rate images which are grainy. The digi-pack version I wanted for the CDs. The DVD is also in excellant audio and picture quality. I decided to opt out on the DVD boxset. Some info about the new album. In todays(30th april) paper edition of my local newspaper,Göteborgs-Posten,(Swedish) there is an interview with a guy called Christoffer Berg. He is currently working with DM on their new album. He has spent the last month with the band in Santa Barbara, CA helping out programing the bands synthesizers and creating sounds for the new album. According to him there will be three more studio sessions this year, the next one in four weeks time. No date for the new album has been set yet. The article finishes with Christoffer saying "The material for the new album is exceptional good and some of the songs will be classics"